Many often count learning a new language among their New Year’s resolutions, and given how we live in the digital age, many require an app for such a task.Enter Duolingo. The platform is one of the most popular language-learning apps in the world with 23 languages available and several more in the works. 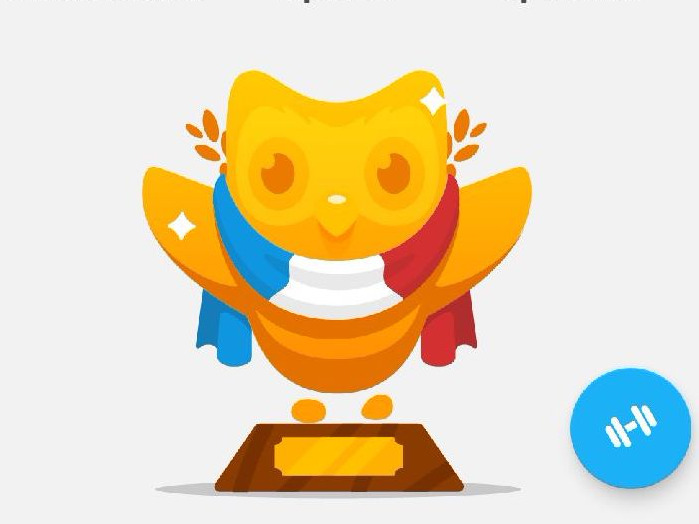 After getting several recommendations to use Duolingo for learning a language, I embarked on teaching myself French in 2016. Just over one year later, I may not be a master at French, but I’ve learned a lot about the language, and the app itself. Here’s a bit about my experience with Duolingo and some advice on how to tackle learning a new language using the app. I decided to start using Duolingo ahead of a trip to Prague. I’d hoped to learn a few Czech phrases before my trip, but Czech wasn’t available at that time. Having already downloaded the app, I decided to study French, which is the language I studied in college. 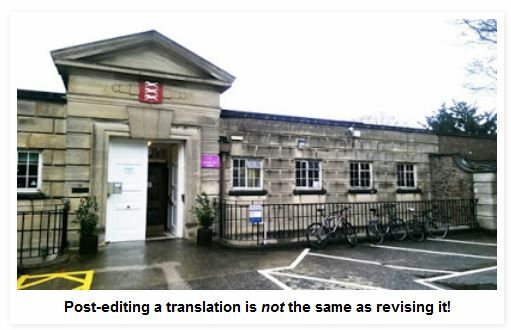 Like many, I didn’t remember anything from my college study. I have my daily goal set to Serious, which requires completing three lessons daily, but I’ll often do more lessons if I have the time, typically around five or six. At one point I had my daily goal set to Insane, but I found I’d slack off when I knew I was on the hook for five lessons a day. I’ve found the easiest way for me to get my lessons in is to use Duolingo during my morning commute on the subway. Duolingo requires an internet connection, but now that there’s WiFi available in most NYC subway stations, it’s easy to load a quick lesson while I’m on the go. (Pro tip: You may be able to access lessons that you haven’t yet completed when you’re off WiFi.) You’ll know you can load the lesson if you can select its icon and it appears in full color, rather than grayed out. Before I started my morning commute study routine, I typically used Duolingo before bed. This routine wasn’t ideal because I’d often be racing the clock to finish my lessons before midnight so I could sleep, and when I was rushing, I found I wasn’t actually absorbing the information. Overall, I recommend studying in the morning. Duolingo’s subscription options get rid of ads (which are a bit annoying) and let users download levels for offline study. 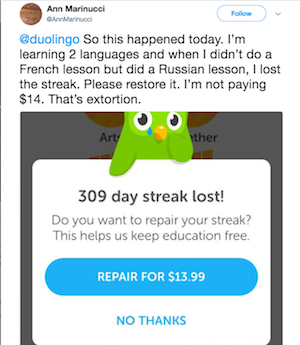 I’ve avoided purchasing Duolingo Plus thanks to my subway WiFi trick, but there have been other situations, like long airplane rides, that made me consider subscribing. I especially don’t see a need to purchase Duolingo Plus now that I’ve completed the French course. Perhaps I would subscribe if I started another course. Duolingo’s treasure chest game that allows users to collect Lingots (in-app currency). Duolingo has several in-app purchases that can be fun and very helpful. Duolingo’s in-app currency is called a “Lingot.” They are easy to collect and nothing in the app is particularly expensive. You earn Lingots when you complete a level and can collect Lingots in a relatively new treasure chest game that comes up after you complete a lesson. You must select one of three treasure chests and get to keep the number of Lingots saved inside — there are typically between one and five Lingots in each chest. You’ll get the option to open a second chest if you watch an in-app ad. Lingots can be used to purchase in-app power-ups, bonus skill levels, and do fun things with the app’s owl mascot, Duo. I’ve attempted a few of the bonus skills — including lessons like local idioms and flirting lines. They’re hard, but may come in handy for those who are using Duolingo in an attempt to learn a language before traveling. I highly recommend using the Weekend Freeze amulet, in case you get busy and forget to do your lessons on a Friday, Saturday, or Sunday. I’ve found I’m less likely to forget my lessons once I’ve purchased the amulet. Each level has a bar which fills up as you complete a skill. Once you complete a level, you must return to old skills to maintain strength in the words you’ve learned or the level bars will drop, indicating a drop in proficiency. I had to force myself to move forward to other lessons and found doing a few new lessons and a few old lessons helped me continue learning while maintaining proficiency in what I’d already learned. Though I am at an “advanced” level in French according to Duolingo, I very much still feel like a beginner. I can read in French, identify words and phrases, and I have a basic understanding of the language; however, I don’t feel confident speaking French out loud. Still, I remain committed to learning French and plan to continue using Duolingo to assist my goals. In-app, I plan to do the listening and speaking exercises more often. So far, I’ve mostly relied on the typing lessons. — Autocorrect on smartphones will make you get things wrong, and you’ll never get used to it. 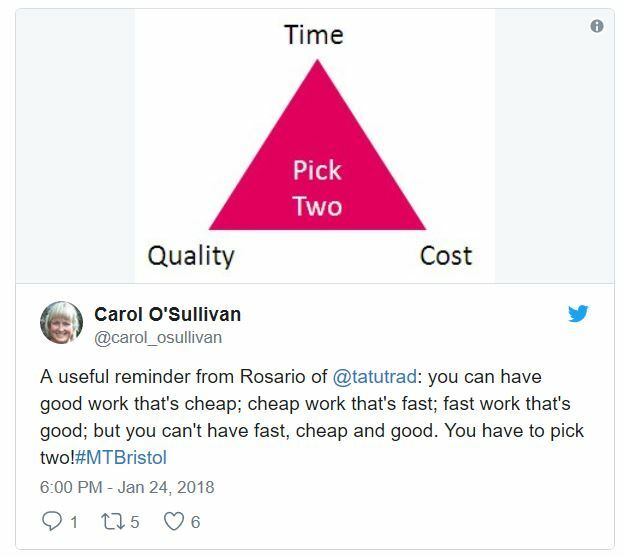 — Reminder notifications and emails often won’t help you remember your lessons. — I turn off the motivational messages from Duo, the owl mascot. He’s super annoying. — Duolingo lets you add friends to the app and challenge them in language study. You can also join clubs on the app for the same purpose. I personally don’t have any friends on Duolingo, nor am I apart of any clubs. 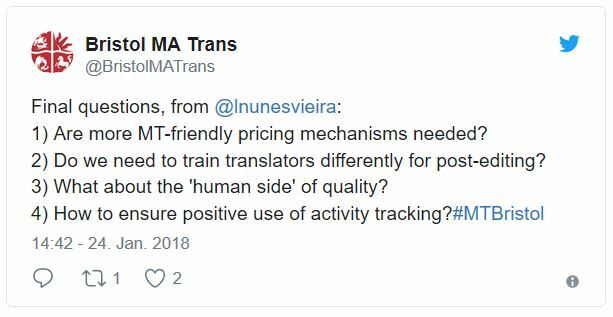 — It’s funny when the options in lessons appear to match what is going on in real life. 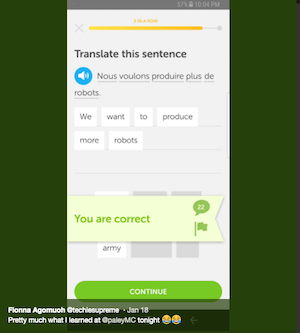 After attending an event discussing the implementation of robots into daily life, Duolingo came up with the following phrase. 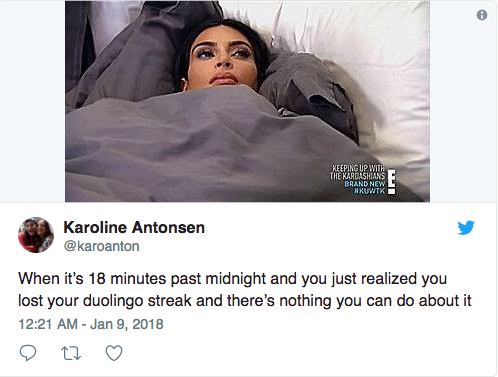 — Memes about being upset at losing a Duolingo streaks are a thing, and they’re hilarious.